Clubroot is the ‘bad guy’. Having clubroot doesn’t necessarily mean you’ve been farming irresponsibly. 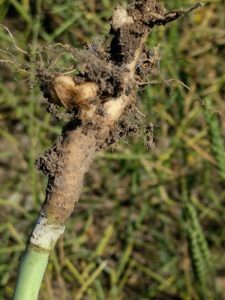 Clubroot spores can arrive in various ways and they will infect canola under the right environmental (moisture, host crop, hospitable soil) conditions. Clubroot infection is often more about the field characteristics and less about the farmer. Farmers who discover clubroot early and take action should be commended. Not singled out. Not blamed. If you’re the first to find it in an area, it might mean you’re the most observant scouter or that nobody else has been brave enough to report their infestations yet. By coming forward, you and your neighbours have a chance to talk about management objectives early, while spore loads are low. Informing stakeholders of new infestations allows people in your community to learn more about preventing and managing the disease including target their scouting efforts and prioritizing clubroot resistance in their variety selection. Who is a ‘stakeholder’ in your community? Neighbouring farms. Retailers. Custom applicators. Municipalities. Anyone coming on your land. Clubroot resistant varieties will be allocated to the areas with the greatest need. Understanding the clubroot concentration in an area helps seed companies and retails provide enough CR varieties to meet demand. Clubroot spore loads may build up or break down in different ways in different regions. With a better understanding of clubroot distribution, research funds can be allocated to answer questions about clubroot behavior in your area. Clubroot is a soil borne disease that affects our whole agricultural community, not just canola growers, and certainly not just canola growers with tight rotations. The more we talk about this disease, the better we will be able to manage it. Alberta: Ag-Info Centre at 310-FARM (3276) or your local Alberta Agriculture & Forestry regional office. Saskatchewan: Agriculture Knowledge Centre at 1-866-457-2377 or your local Saskatchewan Ministry of Agriculture regional office. SaskAg outlines responsibilities in its Clubroot Management Plan. Manitoba: Manitoba Agriculture encourages producers to call them to report the field to help with survey efforts. In Alberta specifically you can report new clubroot infestations to the ag fieldman in the municipality where your infested field is located.